A white-collar suburban father Kyle who is surprised at his office by long-lost college buddy Zack. Zack is as wild and crazy as ever, brimming with excitement about the self-actualization program he's just finished called Rebirth. He talks Kyle into going on a weekend-long Rebirth retreat,handing over his keys, wallet, and phone. Thus begins his journey down a bizarre rabbit hole of psychodrama, seduction, and violence. 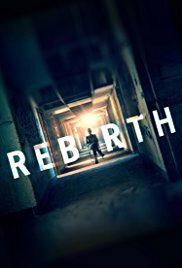 “Rebirth” is a psychological thriller of the Netflix collection. I certainly won’t deny that I have become a fervent supporter of the Netflix Originals series. I’ve seen already some great movies (“Spectral“, “iBoy“, “Before I Wake” and “Message from the king“). And also some less successful experiments (“Mute” and “Death note” eg). “Rebirth” is a special case and ends somewhere in the middle. In essence, it’s not such a bad movie, but there were certain aspects that made me really hate it. Some will even find it an annoying film. I still don’t know whether I should take this film seriously or not. If it was meant to be serious and tried to create an image of how similar organizations function, then it was rather frightening. If, however, it was meant to be satirical, I guess I haven’t noticed it then. For me, it wasn’t really funny. For Kyle (Fran “The Living” Kranz) every day is a duplicate of the previous day. He can be seen as a settled and satisfied model citizen who carries out his day-to-day job. This seemingly carefree existence is thoroughly shaken up the day his crazy, hyper-kinetic ex-school friend Zack (Adam “Once upon a time in Venice” Goldberg) turns up in Kyle’s office and reminds him that they once wrote down a promise. A “Manifesto” with one important slogan: “Don’t be boring“. And that’s something Kyle, after agreeing to go to some bizarre reorientation weekend, is told several times. Unfortunately, “Rebirth” turned out to be somewhat boring with a disappointing final piece. Don’t like your life. Love it! As I said before, especially the end is disappointing. Initially, you see an organization trying to recruit members by means of brainwashing and psychological pressure. I admit it was intriguing. But in the end, it felt incomplete. Perhaps also due to the lack of any explanation. Initially, “Rebirth” looked like a sort of sect, full of esoteric ideas and dogmas, with the aim of allowing the participants to experience a rebirth in which all connections with their inculcating, self-centered living environment are cut. It wants to hold an imaginary mirror up to them and show that the participants are living in an artificial world controlled by others. That they are puppets in a social puppet theater where others pull the strings. Or also, an artificial bubble that you don’t want to pierce because of the comfort, their acquired status, and financial security. Afterward, it seems to be nothing else than a cheap sales organization of food products, which they try to sell through networking at well-organized home parties. In the end, it felt like I had just attended a Tupperware demonstration.